For the dedicated visual observer or imager seeking a top-of-the-line instrument to advance their capabilities and enjoyment in the hobby, the Orion EON 130mm Triplet ED Apochromatic Refractor should be on your short list of candidates. This exquisite telescope features premium optical performance and a high-end fit and finish, but at a price that’s thousands less than that of comparably sized apos from other manufacturers. From front to back, this is truly an awe-inspiring telescope. At the front end, you’ll find a three-element, air-spaced lens assembly of 130mm (5.1″) aperture, with one element crafted from FK-61 ED glass for superb color correction and sharpness. The 910mm focal length makes the EON 130mm Triplet a wonderfully versatile telescope for both deep-sky and solar system imaging or stargazing with plenty of image scale for smaller targets and a moderately fast f/7.0 focal ratio. All air-to-glass lens surfaces bear antireflection multi-coatings for superior light transmission. Contrast is equally rich thanks to blackened lens edges and two internal knife-edge baffles that prevent off-axis reflections of incoming light. The EON 130mm Triplet ED Refractor features an extendable dew shield that further ensures excellent contrast and helps inhibit dew formation on the lens. At the back end of the EON 130mm Triplet ED, you’ll find a heavy-duty 3″ dual-speed Crayford focuser with precise 11:1 fine focus control. Astrophotographers will appreciate that the telescope’s focuser can be rotated in two places, allowing camera framing to be set independently from positioning of the focus knobs at the desired orientation. The focuser features an Orion finder scope base for attachment of any Orion reflex sight or finder scope, if desired. The big focuser’s 3″ drawtube sports an engraved millimeter scale to aid in focus point repeatability, and features a focus-lock thumbscrew, both of which are especially useful for astrophotography. Both the 2″ accessory collar on the focuser drawtube and the 1.25″ adapter feature non-marring brass compression rings. The EON 130mm Triplet comes with two substantial, split-clamp tube rings; a 9.75″ long narrow, “Vixen-style” dovetail mounting plate; and an attractive, triple-latch hard case with custom-fit foam interior. The hinged tube rings feature multiple 1/4″-20 threaded sockets for attachment of mounting plates or other accessories. The protective hard case is delightfully portable at just 35″ long, and the EON 130mm fits snugly inside with its dew shield retracted and thread-on lens cover installed. 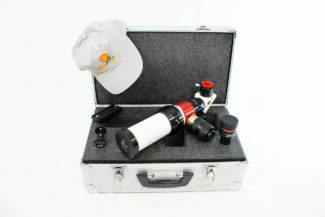 This is a telescope that is so beautiful you’ll want to keep it displayed in your living room for all to admire when you’re not using it under the stars, but when you are using the Orion EON 130mm Triplet ED Refractor – whether for visual or astrophotographic pursuits – you’ll be mightily impressed.